“Greenwald […] advances a brand of anti-imperialism […] informed by a palpable loathing of America, a nation he sees as a dangerous force of evil in the world. Greenwald’s anti-Americanism is so intense he once compared the US overthrow of Saddam Hussein to the Nazi conquest of Europe. “Any nation would be acting foolishly, and self-destructively, if it allowed its foreign policy to be guided by the threat perceptions of people in other countries. When it comes to facing the profound threat posed to American interests by Islamic extremism, it is naturally the case that people in other countries will view the danger posed by that threat as being less serious and important than Americans perceive it to be. This proof that once upon a time, Glenn Greenwald had some eminently reasonable views was unearthed due to a bitter controversy that erupted recently when Sam Harris challenged Greenwald because he recommended an Al Jazeera article that accused Harris of anti-Muslim bigotry. The ensuing exchange between the two prominent writers is characteristic for all too many contemporary debates: while Sam Harris bases his arguments firmly on verifiable facts and observations, Greenwald counters by taking refuge in politically-correct pieties. But that the political correctness Greenwald now champions is as corrupt and dangerous as ever is perhaps best illustrated by his glowing endorsement of a “superb review of Harris’ writings on Israel, the Middle East and US militarism” published on Mondoweiss by one of the site’s regular contributors. Mondoweiss is of course a site well-known for peddling antisemitic memes, and by linking to it in order to buttress his accusations that Harris is promoting “Islamophobia”, Greenwald demonstrates that not all forms of bigotry are equally troublesome to him. Glenn Greenwald may think this is “superb,” but it really is utterly stupid and disingenuous. It is stupid because an observation that is true for the present cannot be invalidated by pointing out that at some other point in history, things were different. Harris didn’t claim that throughout history, suicide bombings were usually perpetrated by Muslims; he simply highlighted the well-documented phenomenon that in recent times, it has been primarily Muslims who have perpetrated suicide bombings and that such “martyrdom operations” are widely accepted and regularly glorified by Muslims. The problem with this politically-oh-so-correct mantra that there are “bad apples” everywhere is that not everywhere “bad apples” are considered bad. Very different from what Greenwald claims, no prominent Christian or Jewish leader could make such statements without a storm of outraged media coverage and vociferous demands for his resignation. But when the “Global Mufti” Qaradawi propagates the vilest views inciting hatred and justifying violence, the western media don’t have to say much about such appalling statements broadcast in the Muslim world to a devoted audience of an estimated sixty million believers. And if all religions are equally likely to have adherents “who do awful and violent things in the name of that religion,” there should be broad majorities of Christians or Jews who favor something comparably revolting to Sharia punishments such as “stoning people who commit adultery, whippings and cutting off of hands for crimes like theft and robbery and the death penalty for those who leave the … religion.” If all religions were really equally likely to have adherents “who do awful and violent things in the name of that religion,” there should also be many millions of Christians or Jews who admired Al-Qaeda-like groups for most of the past decade. It is indeed bigotry when the actions and views of a few extremists or fringe groups are taken as representative for a much larger group of believers, but it is also a form of bigotry to ignore well-documented evidence showing that what would be condemned as extremist for Christians and Jews is widely accepted in the Muslim world. First published April 13 on my JPost blog. It’s probably not a good idea to try to debate Islamophobia on Twitter – but I got involved in such a debate anyway because I was thinking about this issue after having read a very interesting post on “Theocracy in the UK.” However, the Twitter debate wasn’t at all related to this post. At the point I joined in, the focus was on the controversial term Islamophobia, which in my view is very problematic because it implies that the teachings of Islam cannot legitimately be criticized. To illustrate my point, I linked to a post of mine entitled “Who’s defaming Islam?,” where I argued that there are plenty of examples of popular Muslim leaders or widely respected authorities making statements about Islam that depict the faith as requiring Jew-hatred and support for jihadi terrorism. I then focused in particular on Sheik Yusuf Qaradawi, because he is without a doubt a mainstream figure who is regarded as a great scholar by many millions of Muslims and who has even been described as the “Global Mufti” due to his enormous influence. “Throughout history, Allah has imposed upon the [Jews] people who would punish them for their corruption. The last punishment was carried out by Hitler. By means of all the things he did to them – even though they exaggerated this issue – he managed to put them in their place. However, in the debate on twitter, two people were resolved to downplay both Qaradawi’s Jew-hatred and his influence. @LutherBlissetts claimed triumphantly that Qaradawi wasn’t the only one who regarded the Holocaust as a divine punishment inflicted on the Jews, citing the fervent (and controversial) supporter of Israel John Hagee and Rabbi Yoel Teitlebaum (the Satmar Rebbe). But it is of course a platitude to say that there will be some diversity and a range of views in any given group of people – whether it’s a religious, political, social or ethnic group. 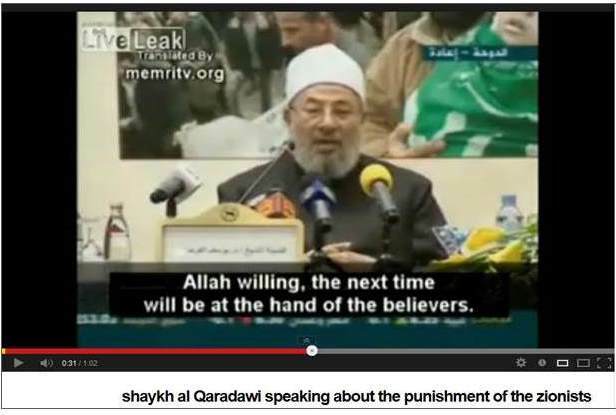 It’s also a platitude to say that in any group of people, there are likely some fringe figures with bizarre and outrageous views – and Qaradawi wouldn’t be worth mentioning if he was such a fringe figure. In the context of the debate about the term Islamophobia, my point about Qaradawi being mainstream by virtue of his huge following and influence was therefore a different one: while Qaradawi’s standing obviously does not justify bigotry against individual Muslims, it illustrates very well the problems with the term Islamophobia. While Qaradawi may not accept the wording here, he certainly is an enthusiastic advocate of an Islam that stands for violence – indeed for genocidal violence – and a “clash of civilizations” when it comes to the Jews (and to a somewhat lesser degree to the US and the West). So should Qaradawi – and the many other Muslim clerics and scholars who preach similar views – be denounced as Islamophobic ? The problem is obviously – as this debate illustrated all too well – that it is much more likely that it is considered Islamophobic to argue that there is a serious problem when somebody with Qaradawi’s views is mainstream. But soon enough, this was no longer good enough. With a new administration in Washington trying to distance itself from Bush’s “war on terror” at least rhetorically, there were determined efforts to avoid any reference to Islam. By now, however, it seems clear that this avoidance strategy hasn’t been helpful in any way. Unfortunately it seems that Mead’s common sense arguments won’t be welcomed by those who prefer to complain loudly about “Islamophobia” while they themselves dismiss the distinction between Muslims and violent extremists who justify savage acts of terrorism in the name of Islam. As the recent controversy about ads in several US cities that denounce violent jihad as “savage” illustrates, we apparently live in a time when it is “anti-Muslim” to feel it is “savage” that self-described jihadists would consider videos of beheadings “very, very important” tools for recruiting volunteers to their ranks. And apparently, it’s also beyond the pale to recoil at the savagery of Muslim fanatics who proudly announce that they will keep trying to kill a fourteen-year old girl that they already injured grievously to silence her demands for education, respect and dignity. The prominent Egyptian-American writer Mona Eltahawy, who is widely considered a liberal activist, has done much to publicize the controversy about the ads denouncing violent jihad as “savage.” As I have documented, she responded to the ads by declaring herself a “proud savage;” she then proceeded to deface one of the ads and, in the aftermath of being arrested and charged with misdemeanor and criminal mischief, she started a very successful publicity campaign to style herself as a latter-day heroine of the Civil Rights movement – while boasting at the same time that she and her supporters succeeded in getting the New York Metropolitan Transportation Authority (MTA) to announce revised advertising guidelines. After all this agitation, Eltahawy has now decided that it was finally time to do what one could have expected from a prominent writer long ago, and she has taken to the pages of the Guardian’s Comment is Free (CiF) website to make her case in writing. “Five days after I spraypainted over a racist and bigoted advertisement in the New York subway, a man set fire to my brother’s local mosque. He struck just a few hours after the mosque’s kindergarten had been filled with children at Sunday school, including my four nieces and nephews. Leaving aside the fact that Eltahawy of course knows full well that the accused arsonist was reportedly motivated by his anger about recent anti-American violence in the Middle East, it is noteworthy that it apparently wouldn’t occur to her that, due to the fanaticism of violent jihadists, hundreds of thousands of Israeli children live daily under the threat that her nieces and nephews might have faced attending Sunday school in a mosque in Ohio. One could also recall in this context the terrorist attack on a religious seminary in Jerusalem in spring 2008 that resulted in the killing of eight students and the wounding of 11 others – a result that was cheered and celebrated by Hamas supporters in Gaza. While Eltahawy would not hesitate to express her loathing of Qaradawi’s views on women in the strongest terms, she apparently takes no offense when Qaradawi tells his “huge audience” of followers that the extermination of Jews by Muslims is divinely ordained – so much so that even the “stones and trees” will do their part by betraying any Jew who might hide behind them. Whether Eltahawy and her supporters like it or not, the kind of Jew-hating jihad preached by Qaradawi and recently threatened by the Supreme Guide of Egypt’s Muslim Brotherhood is indeed savage in the context of 21st century civilization. The claim that it is “anti-Muslim” to say so unfortunately makes sense only if one accepts that Qaradawi’s Jew-hatred is and should be part of mainstream Muslim beliefs. Mona Eltahawy seems to accept that when she rails against the condemnation of jihad as savage and adopts the hashtag #ProudSavage, but fails to even acknowledge the appalling ideology and acts of the violent jihadists of our time. Very different from what Eltahawy suggests, nobody who wants to be taken serious will demand that young Muslims apologize for “something they had nothing to do with.” But it is entirely reasonable and justified to expect Muslims – whether younger or older – to understand that demands to ignore the horrors advocated and perpetrated by violent jihadists won’t do much to combat anti-Muslim bigotry. 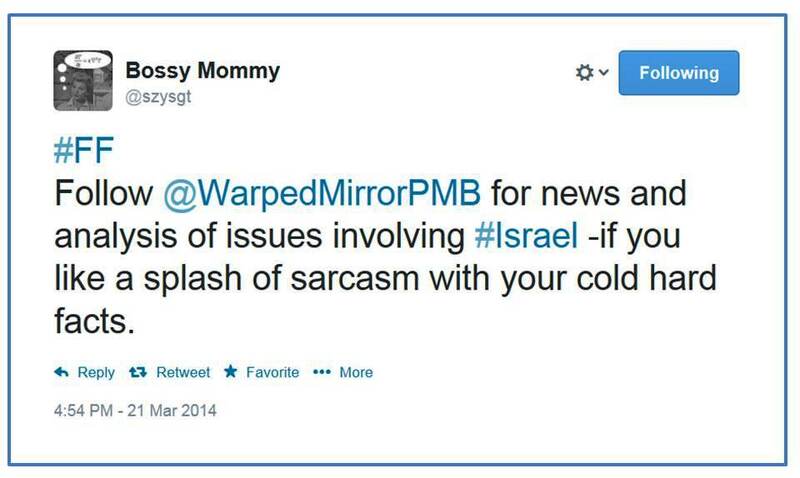 This post was first published at my JPost blog and, under a slightly different title, cross-posted on CiFWatch. “This is a Reuters photo that ran on the New York Times front page for Sept. 1, 2004. It shows an Israeli bus after it had been blown up by a suicide bomber. Neither bloody nor gory, the photo is nonetheless deeply disturbing, because it shows the lifeless body of a young woman hanging out a window. Some three weeks have passed since the controversy about the ads denouncing violent jihad as savage erupted, and neither Mona Eltahawy nor her fans and supporters have bothered to explain why they object to this. I have asked this question a few times on Twitter, but either I didn’t get any answer – which actually was sort of the best-case scenario – or I got blocked (this was Mona Eltahawy’s response) or I had some abuse hurled at me. Sad times for self-described progressives: it seems they can function only in a well-insulated echo-chamber. Following the links provided here leads to two articles by Mona Eltahawy. The first was written in July 2005, shortly after the 7/7 London bombings; the second one is from January 2006 and comments on the riots staged by Muslims in response to some cartoons published in an obscure Danish newspaper. In both articles Eltahawy expresses views she apparently no longer holds – because if she did, it’s hard to see why she would have been so incensed by the denunciation of violent jihad as savage. “the cartoon incident belongs at the very center of the kind of debate that Muslims must have in the European countries where they live – particularly after the Madrid train bombings of 2003 and the London subway bombings of 2005. While right-wing anti-immigration groups whip up Islamophobia in Denmark, Muslim communities wallow in denial over the increasing role of their own extremists. Not only does Hizb-ut-Tahrir, an organization banned in many Muslim countries, have a branch in Denmark, but Abdullatif has a history of calling for violence that he then justifies by referring to freedom of speech – the very notion the Danish newspaper made use of to publish the cartoons. In October 2002, Abdullatif was found guilty of distributing racist propaganda after Hizb-ut-Tahrir handed out leaflets that made threats against Jews by citing verses from the Koran. He was given a 60-day suspended sentence. Abdullatif used the Koran to justify incitement to violence! And we still wonder why people associate Islam with violence? Tobin, however, is making the same mistake that I made: he wrongly assumes this is a rational debate. But it isn’t a rational debate – and as far as Mona Eltahawy is concerned, it shouldn’t be a rational debate. Indeed, it seems she feels that as long as she has some 165 000 followers on Twitter, rational argument is just a waste of time.